WELLS 800FL Coil Transfer System. Automatic high speed innerspring unit construction. Available with or without electric tempering of the coils. Sound enclosure for coiler fitted as standard equipment. Operator protected by photoelectric system. High speed operation (up to 1200 stitches/min). High production (up to 220 meters/hour). 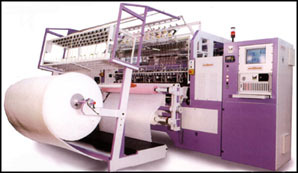 Twin line sewing (to quilt twin patterns combined with single lines). New master computer (360 degree embroidery, twin line and jumping). Jump and Tack for single or twin line isolated patterns.